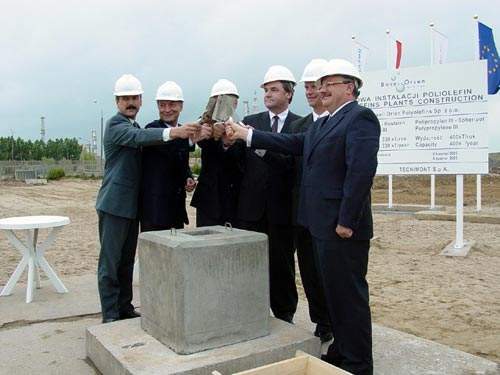 On 25 June 2003 Basell Orlen Polyolefins celebrated its First Brick Ceremony in the city of Plock, Poland. The palnt is close to the PKN Orlen site. More than 160 people attended the ceremony. The Basell Orlen Polyolefins joint venture built what is said to be one of the largest polyethylene and polypropylene plants in the world. Basell provided technology for the plant built at PKN Orlen's site in Plock, Poland. 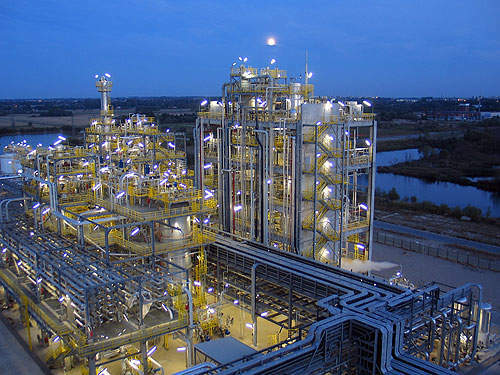 The LyondellBasell and PKN Orlen JV plant in Plock, Poland. 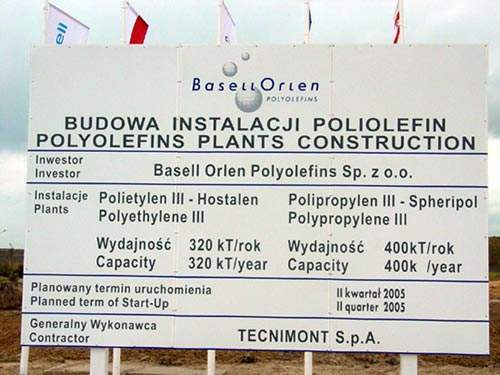 During October 2005, Basell Orlen Polyolefins (BOP) announced that it had begun producing polypropylene (PP) and high density polyethylene (hdPE) at its plants located in Plock, Poland. The PP plant, based on Spheripol technology, has a capacity of 400,000tpa, while the 320,000tpa hdPE plant is based on Hostalen process technology. Both the technologies are developed and licensed by LyondellBasell. In May 2010 LyondellBasell declared force majeure on PP production due to technical problems in polymerisation. The company, however, assured customers that it would resume production and supply at the earliest. The plants, including the logistics platform, required an investment of €500m. The project was completed on time. BOP is a joint venture between Basell Europe Holdings and Polski Koncern Naftowy Orlen (PKN). Basell Europe Holdings is part of the LyondellBasell group while PKN Orlen is one of the largest refiners and oil distributors in Poland. The plant is the only polyolefin producer in Poland. Products from the plant serve Eastern European countries as well as Poland. During May 2005 BOP signed an agreement with Poland’s Polimer Centrum in which the company became BOP’s authorised distributor for BOP and LyondellBasell products. The company joins two other distributors, Krakchemia and Brenntag. The facility produces 400,000tpa of polypropylene (PP), using LyondellBasell’s Spheripol technology. The high-density polyethylene (hdPE) plant has an output of 320,000tpa and uses LyondellBasell’s Hostalen technology. During the final quarter of 2003, Italy’s Tecnimont announced that it had been awarded a lump sum turnkey contract for the engineering, procurement and construction of the polyolefin production facilities at Plock, Poland. The value of the contract was not revealed. Construction work began at the site in June 2003. In May 2004, Poland’s Polimex-Cekop announced that it had been selected as the main subcontractor for the polyolefin project. LyondellBasell is providing its Hostalen, low-pressure slurry process for the production of bimodal hdPE on the plant. The process is said to have accounted for 3.8mtpa of licensed capacity. At the same time, LyondellBasell’s Spheripol process is used on the plant. The process is used for the manufacture of PP homopolymer plus random and heterophasic copolymers. The process is said to have excellent investment and operating costs. Coperion Werner & Pfleiderer, based in Stuttgart, Germany, was awarded a contract to build a line for pelletizing the polypropylene. The system is designed to have a throughput rate of 55t/h to 60t/h. During the final quarter of 2003, Tecnimont awarded Honeywell Process Solutions a contract valued at $2.7m for a comprehensive automation system. Honeywell supplied Experion PKS and its Fail Safe Controller (FSC). The contract included supply of hardware and a series of engineering services from Honeywell Italy’s project operation team. PKN Orlen supplies BOP with propylene and ethylene feedstock from its existing olefin production facilities in Plock, Poland. BOP and LyondellBasell Polyolefin Company have entered into an off take agreement for the exclusive sale and purchase of polyolefin grades produced by BOP. LyondellBasell Polyolefin determines the annual the quantity of material it will purchase. In preparation for the opening of the production facilities, BOP also built a logistics and distribution centre. Netherlands-based VOS Logistics was engaged to support the installation of these facilities. As well as LyondellBasell and PKN Orlen bringing their strengths to the joint venture, the project is also expected to have a ‘strong demonstration’ effect on the Polish petrochemical industry. In particular, it is expected to show the advantages of promoting sector modernisation through attracting foreign direct investment and state-of-the-art technologies.